I rarely get to travel these days, but when I do, it’s only fitting to be at the enchanting Samal Island, a pleasant respite from the excruciating summer heat. 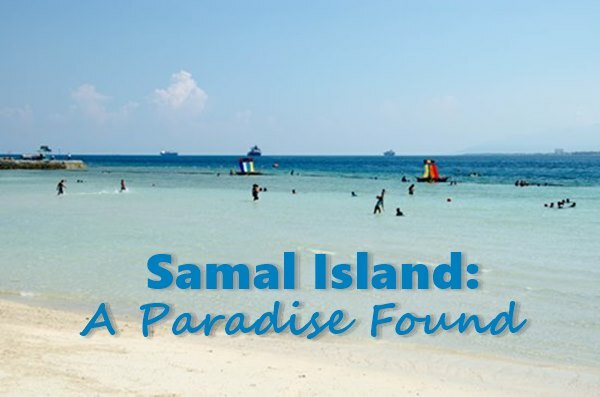 Situated within Davao Gulf, Samal Island is 2 kilometers away from Davao City. It boasts of gorgeous white sand beaches, crystal clear blue waters, active wildlife and a slew of other tourist attractions to keep every tourist busy. On the last day of the event we attended in Tagum City, my friends and I packed our bags and left our hotel rooms to take an hour and half trip to Davao City before embarking on a short 15-minute boat ride going to Babak Port in Samal. 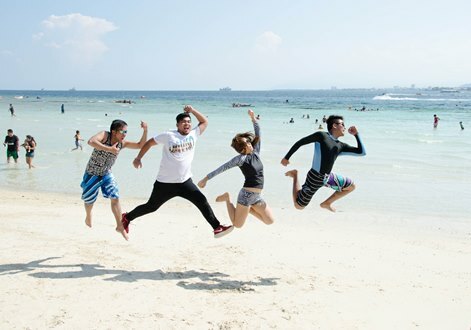 We honestly didn’t have a real itinerary when we got there but what we agreed on was to take a day tour to sample one of Samal’s famed beaches before we take our flight back to Cebu in the evening. Finally, we arrived at Samal Island! After exiting Babak Port, we were greeted by a long queue of tricycle drivers who were more than eager to ferry us to our next destination. 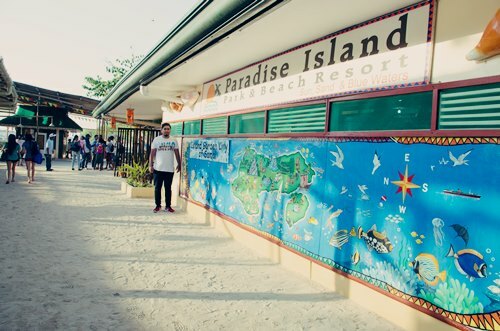 Our driver suggested that we try Paradise Island Park and Beach Resort. It’s important that you lock him on your agreed rate for the transportation before you leave so there won’t be any miscommunication. There were six of us and we paid P30.00 each. If you can haggle for a cheaper rate than we have, the better since the resort is only a few meters away from the port. Once we set foot at the resort, we each paid P200 as our entrance fee for the day use of their amenities. Expect to pay more for an overnight stay and other special accommodation. I find their rate a little steep for budget-conscious travelers like me, especially when we’re only there for a few hours. 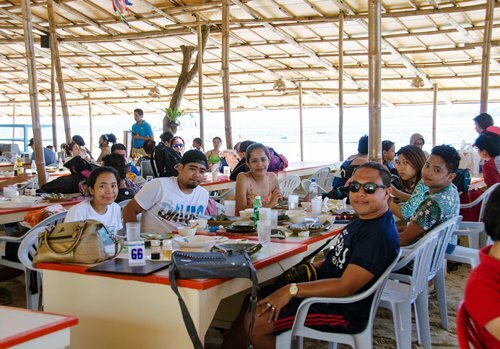 Their staff assisted us in safekeeping our luggage while we eat at their open-air restaurant just right beside the beach. 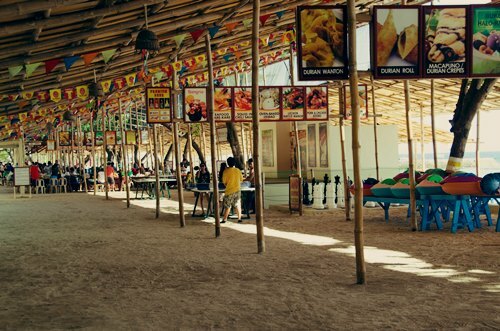 Don’t expect anything special here as the resto itself is pretty basic–nothing but a huge wooden canopy covering the entire beachfront and endless stretches of wooden tables and monobloc chairs. The service was painfully slow so we had to take pictures around the resort while we wait for our food. It’s also worth mentioning that they don’t allow food and drinks brought from outside so you are left with no choice but to buy from them. In my opinion, their food was decent at best but a bit overpriced. 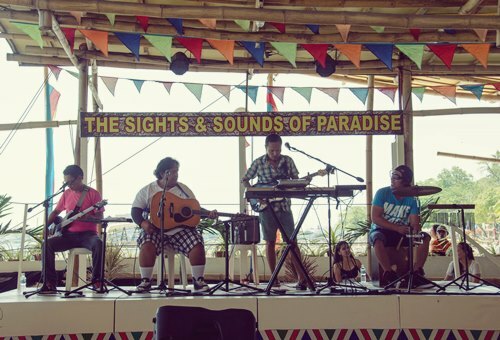 7. be entertained by their live band playing popular tunes or watch fire dance and carnival shows on special days. While you’re dining, there’s a live band that plays pop, rock and other genres of music. Walk around and you’ll surely find something interesting to do. What I enjoyed doing was strolling around their clean and well-maintained recreational parks and rented villas. Expect to find all sorts of beautiful trees and flowers to delight your eyes. When you’re here, feel that sweet breeze on your skin and just enjoy every moment of it. Never let the sweltering humid take away your sense of fun and adventure because you’re here to immerse in the experience. Best of all, frolicking by their powdery white sand beach and sky blue waters was of course, the highlight of our trip and we made sure that we made the most out of it. 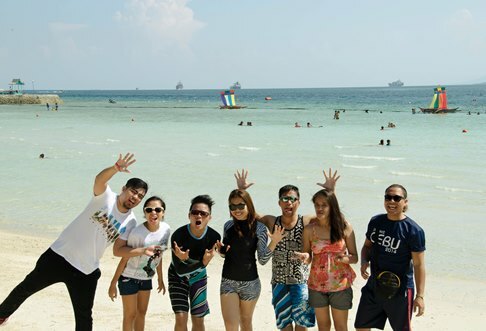 Because we don’t know for sure when we’ll visit Samal Island again. We could have stayed a little longer but we had to leave the resort by 5PM because that was the last schedule for our ferry service back to Davao City. Overall, I find this resort generally clean, organized and safe to bring your family and friends for get-togethers. Their staff is friendly and accommodating. And yes, the beach! It’s what every self-proclaimed beach lover could ask for. My only gripe about this place was that almost everything here is overpriced and that fact that you can’t bring your own food is something that every would-be traveler to this place should carefully consider. Other than that, we had a great time and we thoroughly enjoyed our brief trip in the beautiful Island Garden City of Samal. To get an updated list of their fees, room rates and other facilities, go ahead and check out their website. The place looks beautiful! And it looks like you had a lot of fun; you’re making me miss home and the beach! huhu what would be the ideal itinerary when planning a vacation there though? Would an overnight stay be more enjoyable? Yeah, we did! If money is not really an issue for you, an overnight stay should be ideal if you want to really immerse yourself in the place. They always have different events and activities everyday that you can join. I agree. I wish we had longer time to really explore other sights and places in Samal. Ka nice sa place oi!!! I’ll revisit this when I’ll plan to go here someday! 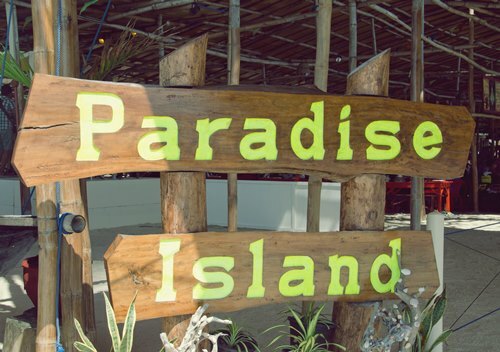 Fitting title for a lovely paradise! Ahh this makes me miss the beach! What’s your next beach destination, Anne? If you happen to be in Davao City, I suggest you make a side trip here, on any beach resorts in Samal. The place is just perfect. I was not really a big fan with their wooden canopy since it actually covered the entire beachfront, leaving the dining area a little unauthentic. 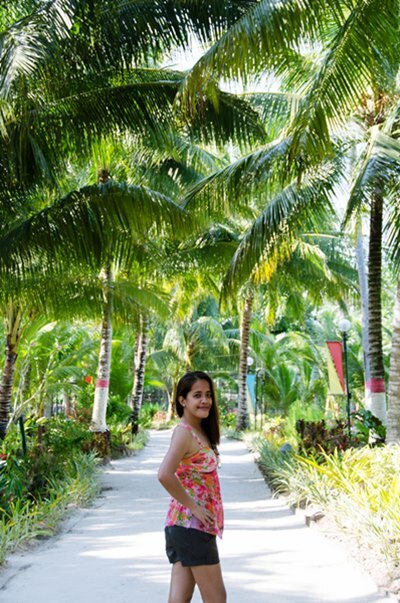 This resort is very commercialized so you won’t have any problems while having your vacation here. I know, right? If only this was somewhere in Cebu, it would have been easier for us to go here anytime. Such a lovely place. I wish to visit this paradise soon too. You must have been drooling a lot of the beautiful view during your trip.